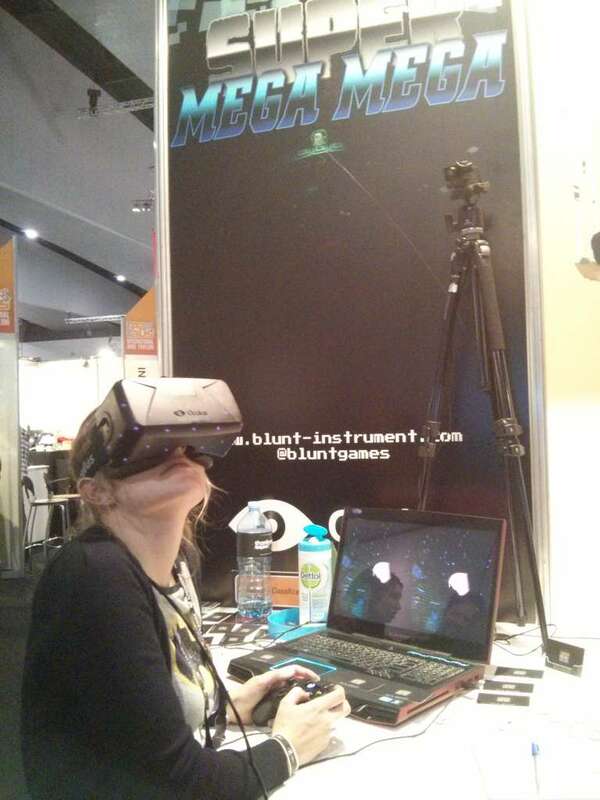 Last week, Katy, Dwight and I went the full three days of PAX AUS at the Melbourne Convention and Exhibition Centre. 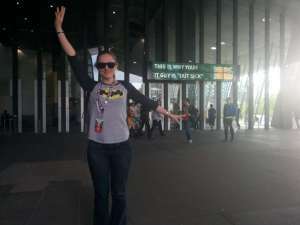 Given the sheer volume and density of things to do and see, we aimed to strike a balance between seeing as much as possible and exhaustion, and for each day picked a few interesting items from the schedule to attend as well as dedicating some time to the expo hall. There was a lot on, and with a reasonable amount of overlap some hard decisions had to be made, but it was a good problem to have. On several occasions I found myself wishing for ‘groundhog day pax’; aka the ability to revisit the paxday over a few times and get everything in. That not being possible, we made some decisions and found some really interesting stuff. 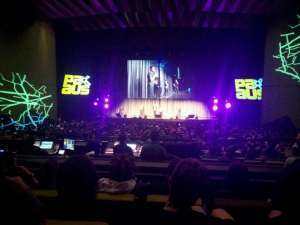 Now, I took a walk around the venue earlier in the year, but being inside during the event with everything going on, it was clear just how much better it is for PAX than 2013 (Melbourne Showgrounds) in just about any aspect you can name: location, size, weather protection, proximity to restaurants, and so on. 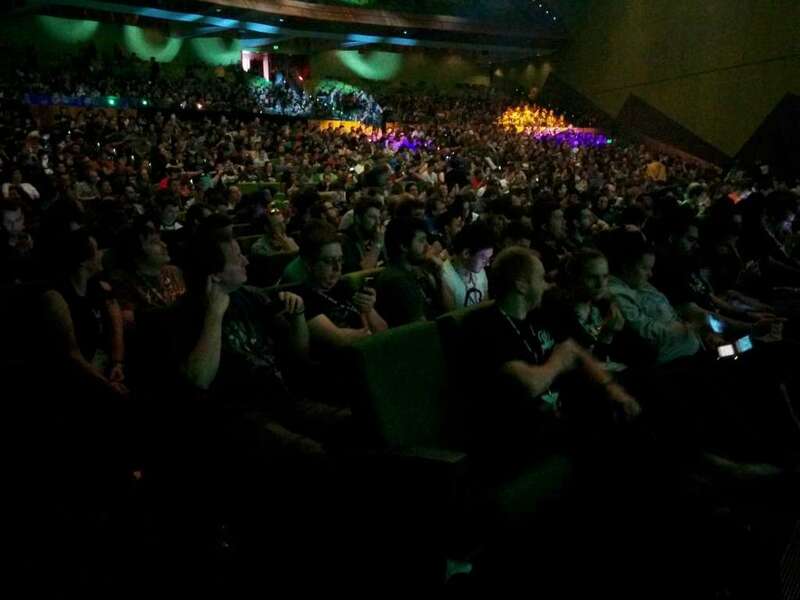 There were a bunch of theaters with ample space to fit practically everyone who wanted to attend a scheduled event, and the need to line up for ~2 hours for the chance to get a seat was eliminated; from our experience it was possible to arrive just before an event was scheduled and still get a seat towards the middle or back of the room. We were fortunate enough to get seats in the front row for a couple of events which was a bonus, but even so, there weren’t really any bad seats to be had. The exhibition area this year was enormous. Our photos don’t really do it justice; but standing inside, it felt immense. 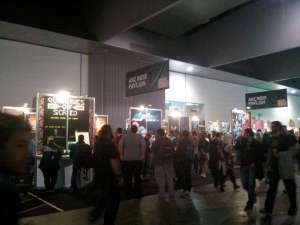 The space was divided into queue room, expo hall, and gaming area, with plenty of room for each. 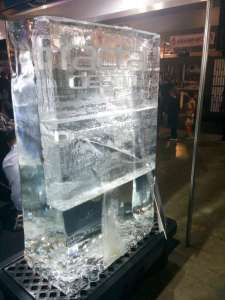 Even so, the expo hall was crowded with the sheer volume of exhibitors and guests. 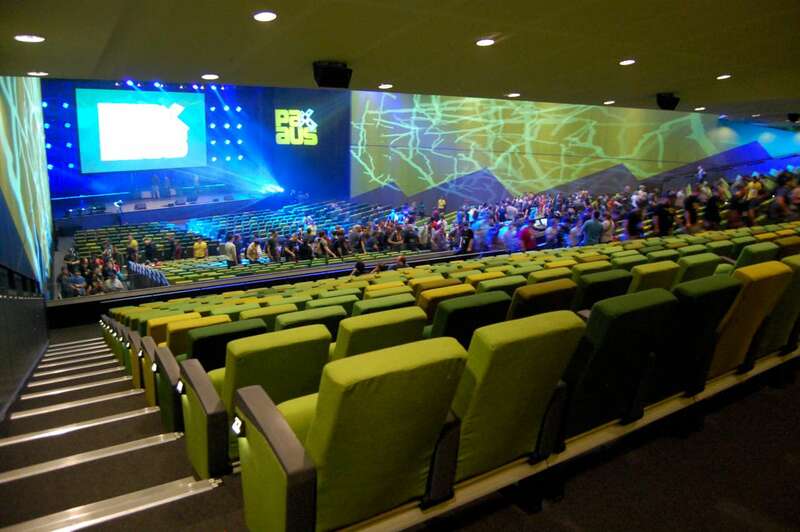 The MCEC is definitely the venue for the job, and with PAX AUS locked in for the next five years we have a lot to look forward to. Throughout the event, the Enforcers seemed to have a good handle on things. 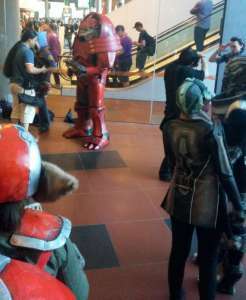 Everyone was friendly, and in general lines and crowd control at PAX are extremely civilized, especially when compared to just about any other public event I have experienced. Everybody is polite, nobody pushes in on purpose, the queue system is orderly. We had a few good conversations with people in lines while waiting to go into panels and the vibe was very positive. 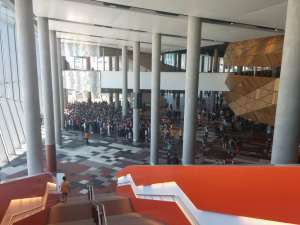 Throughout the weekend we didn’t actually need to participate in the queue room at all, the closest being arriving just in time to see the dregs of the queue tailing off into the building from the street entrance; both morning events we wanted to attend were in the theatres which had their own queue areas; the queue room being for expo hall access only. 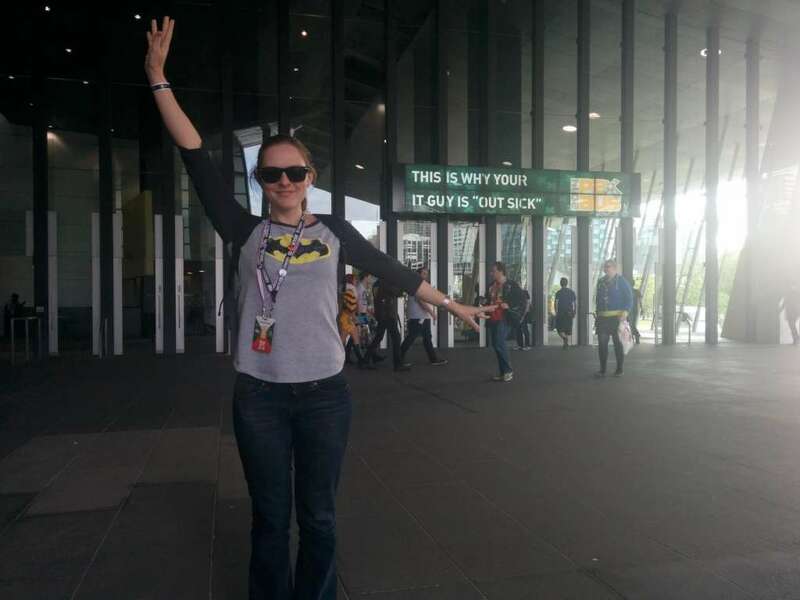 After the first morning queue had flushed through we never had to join a line to get in to the expo hall, just walking past one of the staff and showing our badges and 18+ tags. This was a great approach. 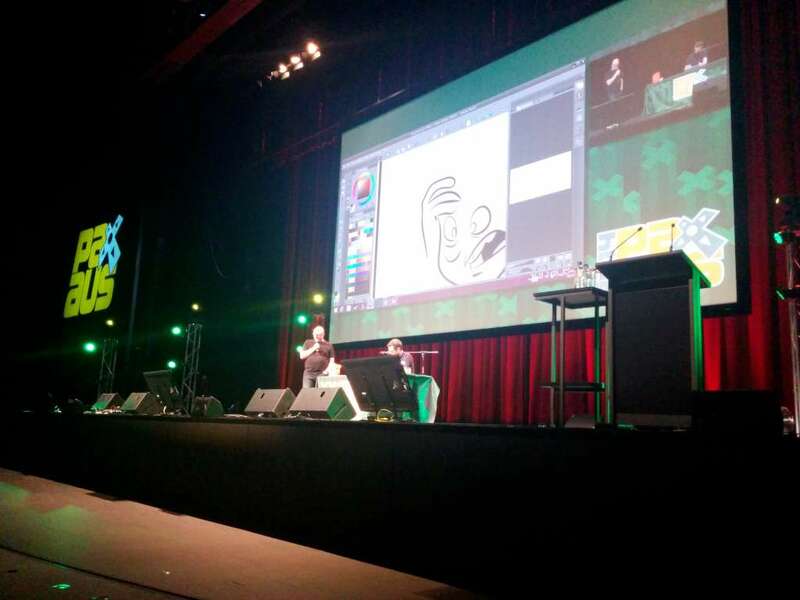 We managed to catch a couple of Mike and Jerrys panels including the Q&A and make-a-strip, which were both great. The new format using pre-submitted questions seemed to work well. Seeing the Penny Arcade crew do their thing is one of the big draws of PAX, and it was a great way to start the weekend. On our way to the expo hall, we took a shortcut through the now empty queue room. We started off with a quick chat to the girl from Evocca College, just inside the entrance. Some of their courses sound interesting. Next we wandered north and I had a go on a couple of VR sets, including Phenomec VR smartview which is a strap-phone-to-face deal in the vein of google cardboard, currently in kickstarter. with the bat by earlier participants. 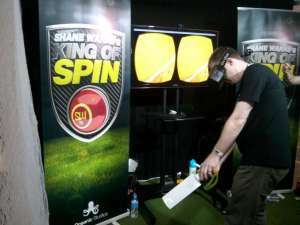 Next I found myself holding a (wii) cricket bat at the Oceanic Studios ‘Warnies King of Spin’ booth. 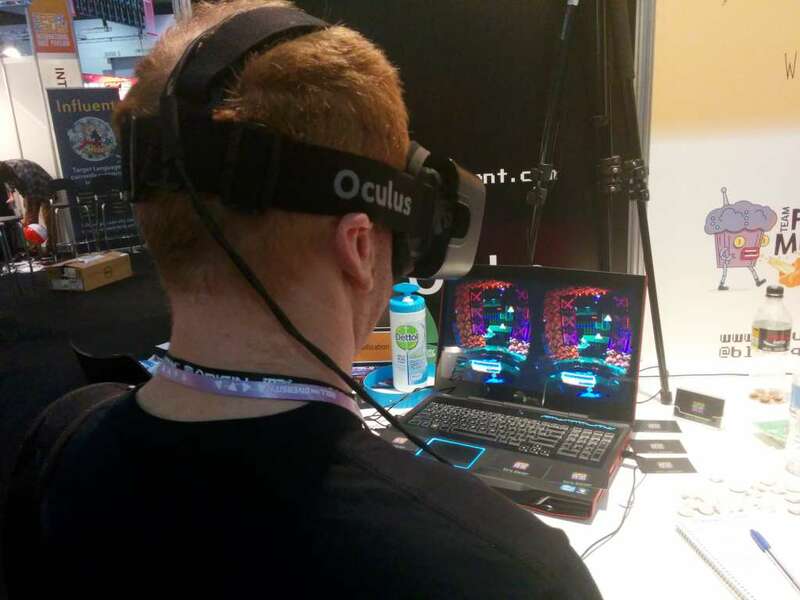 This was actually my first Rift DK2 experience – it didn’t help that I was pretty crap at this game. 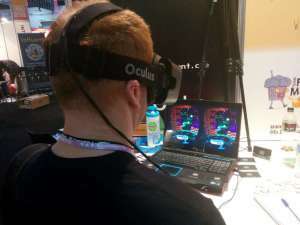 I also suspect the rift based demos in general suffer from lack of precision adjustment for each player, having to fit many guests, and it is not really possible to adjust it to accommodate eyeglasses etc for each individual. I flopped horrendously at the bat game. Turns out I’m not much chop at cricket in meatspace OR virtual. 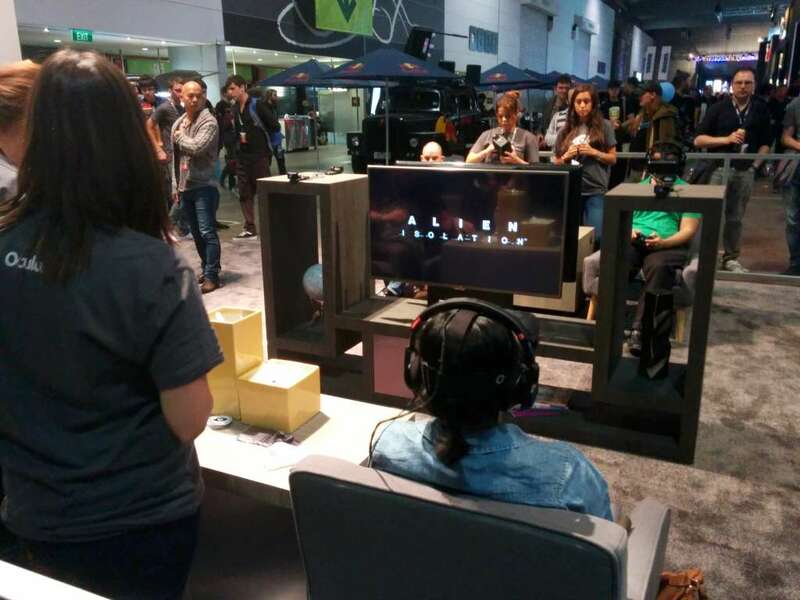 Right next door was the official Oculus booth running none other than the Alien Isolation Rift enabled demo, alongside SuperHot. Both of these looked super interesting but everyone else in the hall seemed to agree, and the line was correspondingly chocked out whenever we happened past. Given the amount of things to cover and the popularity of the Rift demos, we decided not to go out of our way to check out rift stuff in particular as I have a DK2 awaiting testing at home. 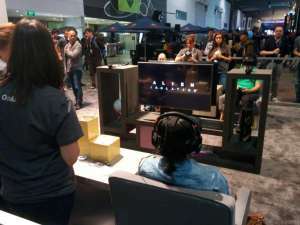 If that hadn’t been the case we definitely would have dedicated more time to queing for these demos as some of them looked very cool. 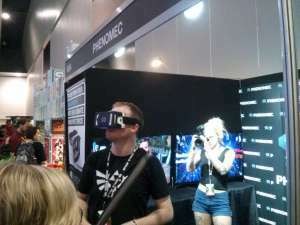 Speaking of the Rift, one of the coolest finds IMO at the show had to be SuperMegaMega by Ryan Alcock of BluntGames. We fluked on this once just as the hall was closing which was more than likely why the line emptied, and Ryan was kind enough to give us all a go before the enforcers cleared out the riff raff like us. I’ve promised myself a dedicated session on SMM, but the couple of minutes I had at PAX left me impressed. The mechanic is easy to pick up, and makes intuitive use of the VR environment. SMM is essentially a side scrolling platformer in 3D, with your character ascending the inside walls of a cylinder constructed of multiple layers of bricks, which provide the horizontal platforms. Movement on the Z axis is via shoulder buttons, and you can aim at enemies using the crosshairs in the Rift. 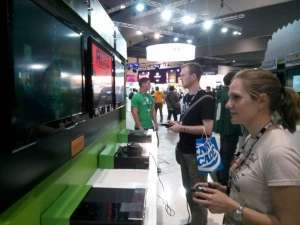 I enthused to Ryan about how fresh the gameplay came across while Katy and Dwight also had a go. I’m super keen to get a copy of this. 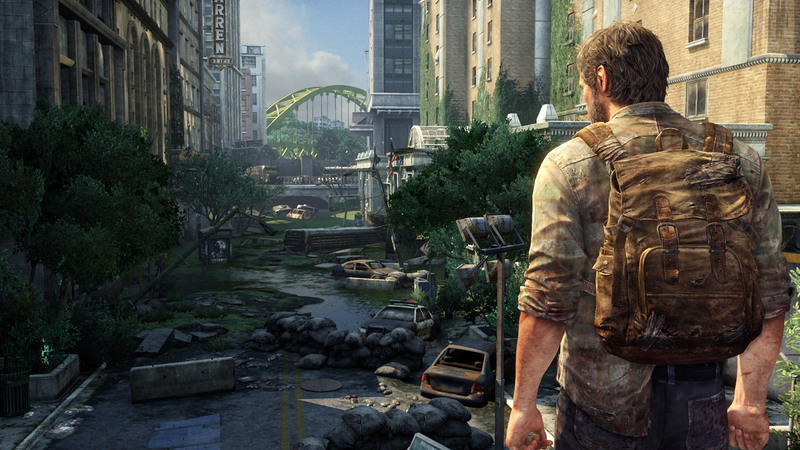 We had a quick tour through Xbox-land and tried a pile of games. 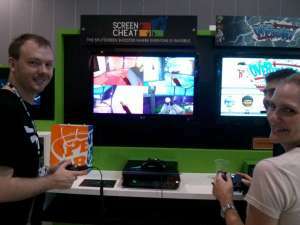 A highlight was Screencheat, an interesting take on FPS strategy. 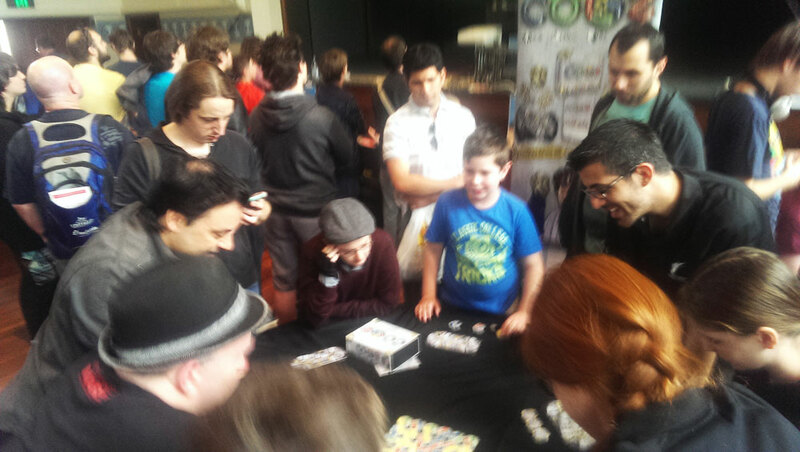 Katy and I had a go of Aztez, which looked fantastic and felt very satisfying to melee-stouch dozens of opponents. 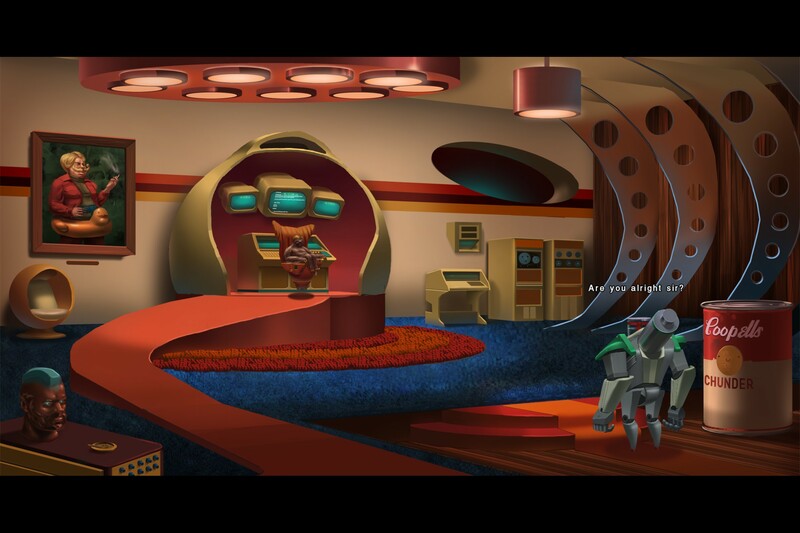 The art style and fluid feel to this one really stood out. 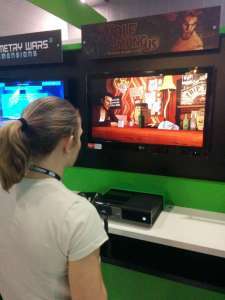 We also saw The Wolf Among Us which was a good opportunity to discuss the telltale games series. 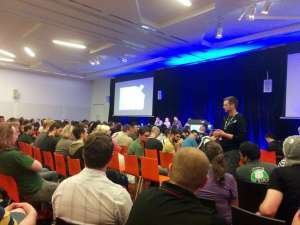 Later at PAX I bought seasons 1 & 2 of Walking Dead on Steam at Dwights recommendation, and as a super unexpected bonus Randy Pitchford and the Gearbox crew presented everyone in the panel audience with a code for Tales from the Borderlands. 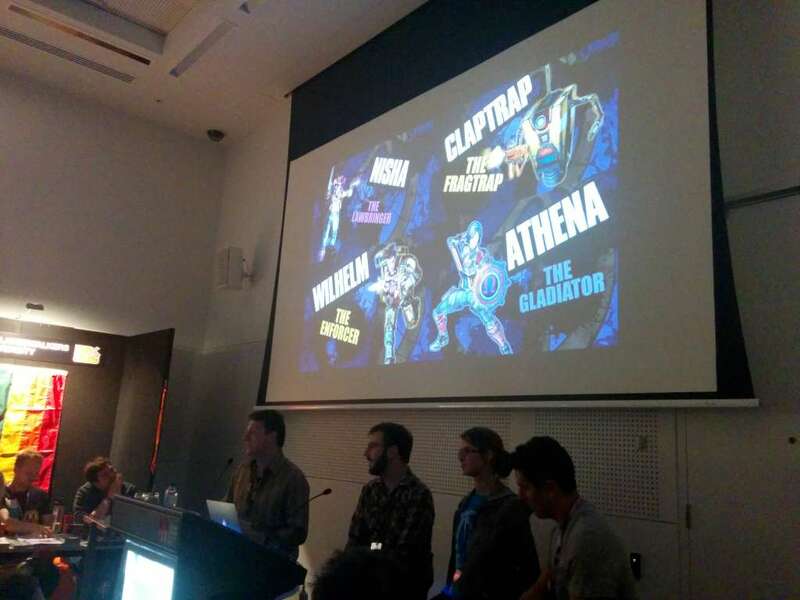 On the topic of Borderlands, the two Gearbox panels were great. The large assembly in the main theater on Sunday morning included a discussion of Borderlands: The Pre-Sequel with a reveal of the new Handsome Jack: Doppleganger DLC, followed by a preview of Gearboxes new in-development title, Battleborn. There are a heap of base classes in this and if Borderlands is anything to go by it should be something to look forward to. Last up was the Tales giveaway which was well received by all. The other gearbox panel was a smaller affair held in the Diversity Lounge, where Randy and the team focused more on character gender diversity in the borderlands series, including TPS. It was a pretty good discussion with plenty of opportunity for adhoc Q&A, given the smaller audience and room size. I really enjoyed this one. Randy in particular impressed me as someone really enthusiastic about the games his company makes and gaming in general. 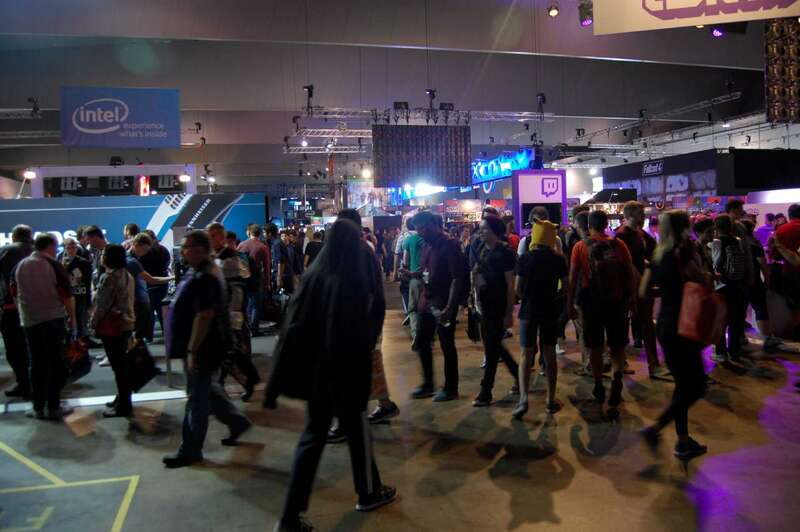 Speaking of the Diversity Lounge, I was left with the feeling it was one of the best kept/known secrets of PAX, in that there was a bunch of great stuff going on there which didn’t appear on the main schedule. 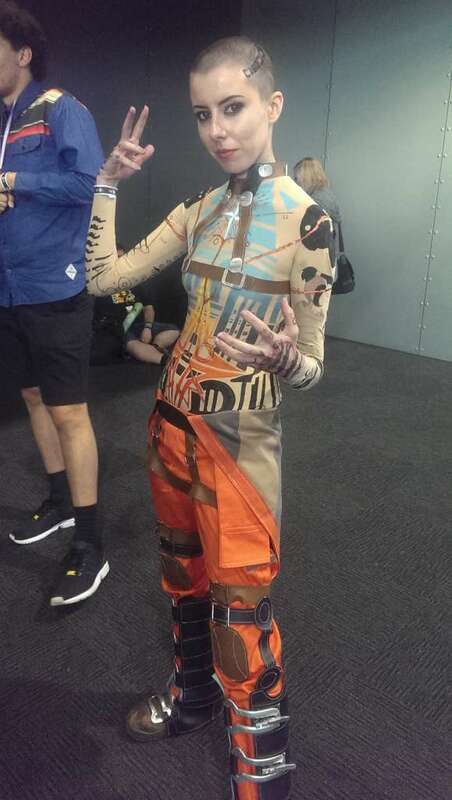 We saw the Gearbox panel as well as Scott Ludlams session on #StopDataRetention, I had my first test of Borderlands TPS on xbox, Dwight had a chat with a bunch of people including Eve Beauregard about the Medic! charity, and Katy started learning the ins and outs of Magic: The Gathering thanks to the starter decks they were giving out. I even saw Robert Khoo passing through. All up a cool place and I’ll be sussing it out again next year. 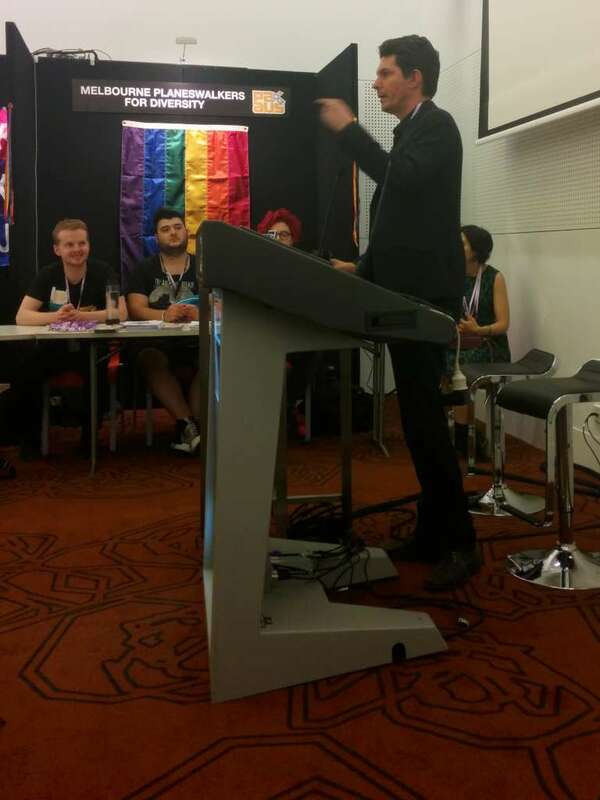 Senator Scott Ludlam tells it like it is. 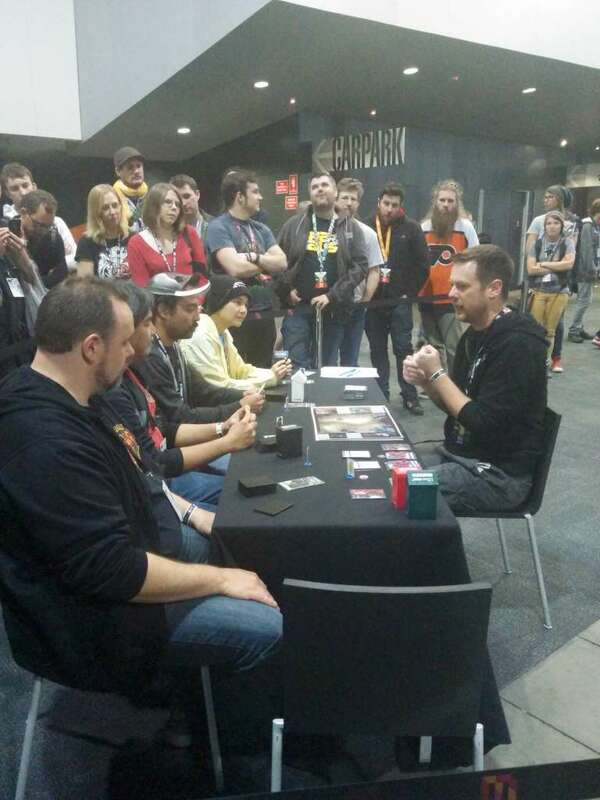 On the topic of card games, Thornwatch made a big appearance this year. Dwight and I headed up to the panel run by Gabe and the PA staff and got to hear a fair chunk of interesting info. I don’t have much of a history with card or tabletop games, but I liked the comics and joined the mailing list awhile ago, and it was really interesting to see the passion and consideration which has gone into the game which was evident through the discussions in the panel. It is clear a bunch of thought and development is ongoing with this project, in particular as Mike Fehlauer and Gabe have a clear difference of opinion on playtesting strategy (Gabe thinks it should be released for public testing, Mike wants to wait a bit longer). We headed down to check out the actual playtesting the next evening, with Gabe and a bunch of enforcers running the show and Fehlauer prowling along the tables in full observer mode. Being a full on card game n00b, it is really interesting from my perspective to see how this kind of thing plays out, and being a fan of PA in general, I reckon when it is finally released, Thornwatch might be a good place to start. 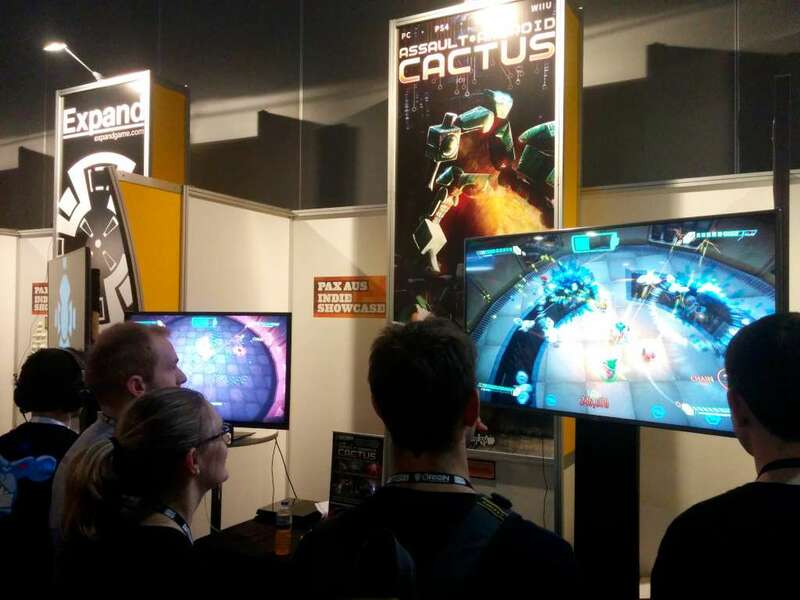 Back to the expo hall, we were particularly keen to make more of a point to chat to some indy devs this year and made sure to take a couple of passes through the indy pavilion each day before the expo hall closed. I appreciated quickly that even the indy area has more things to look at, gamepads to clutch and people to chat to than can reaonably be fit into an evening, so it would have to be a multi-layer multi-day thing. 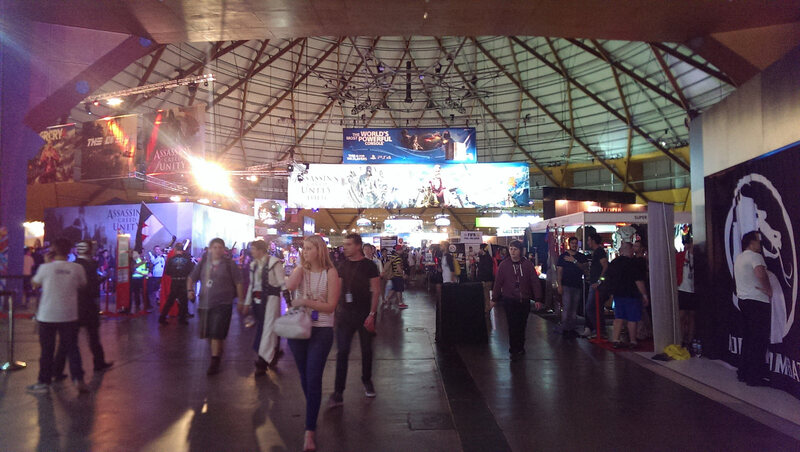 That said, we managed to maneuver our way through some of the throngs and check out a bunch of stuff. 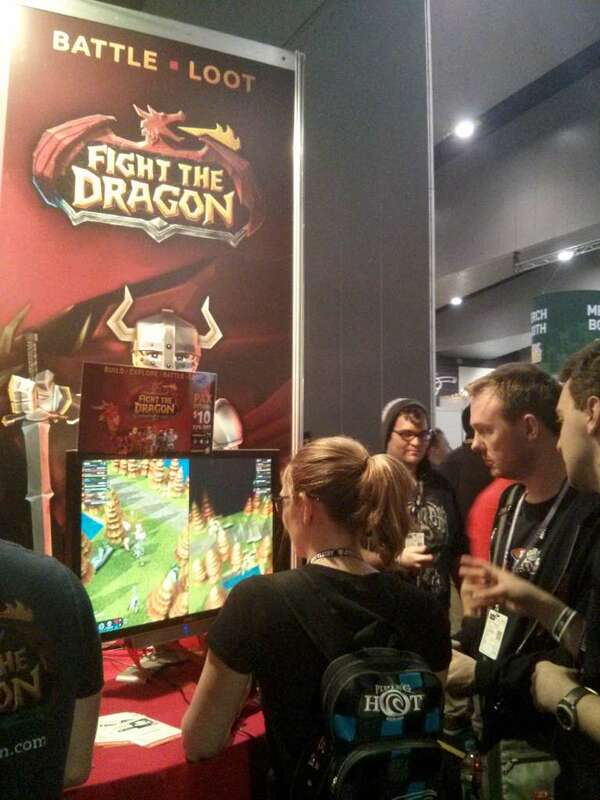 The Australian indy game dev scene appears to be flourishing. 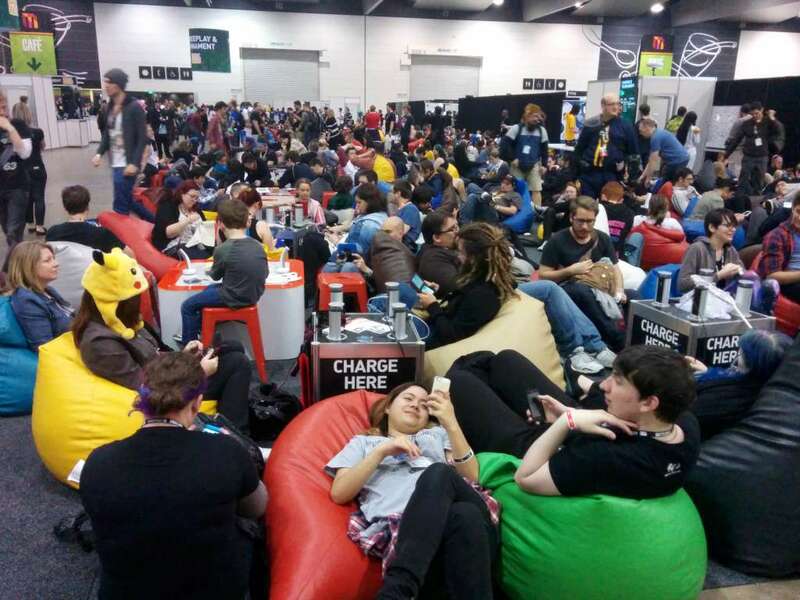 We talked with a couple of internationals, but the majority of our time (and the floor space) was consumed with some very vibrant Aussie projects. 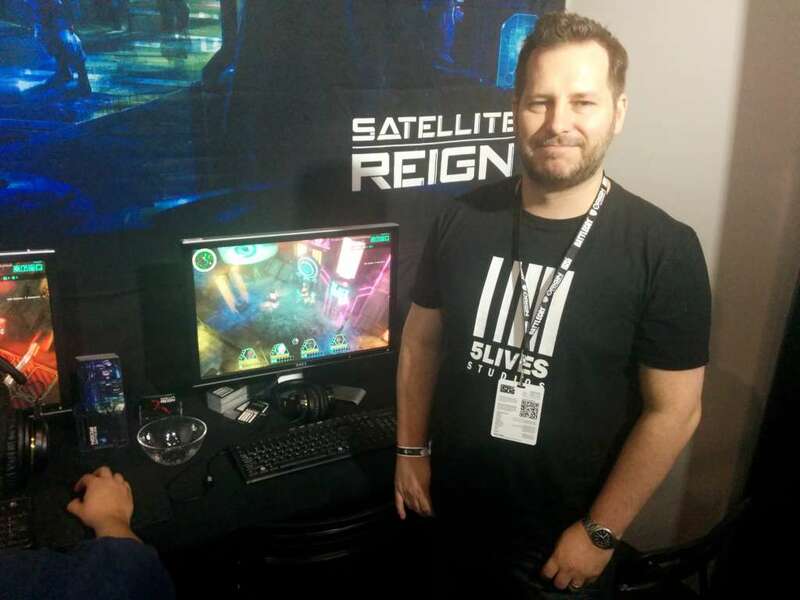 A couple of these groups devs I chatted to reported they had started their own studios in the wake of larger outfits such as SEGA closing their doors. 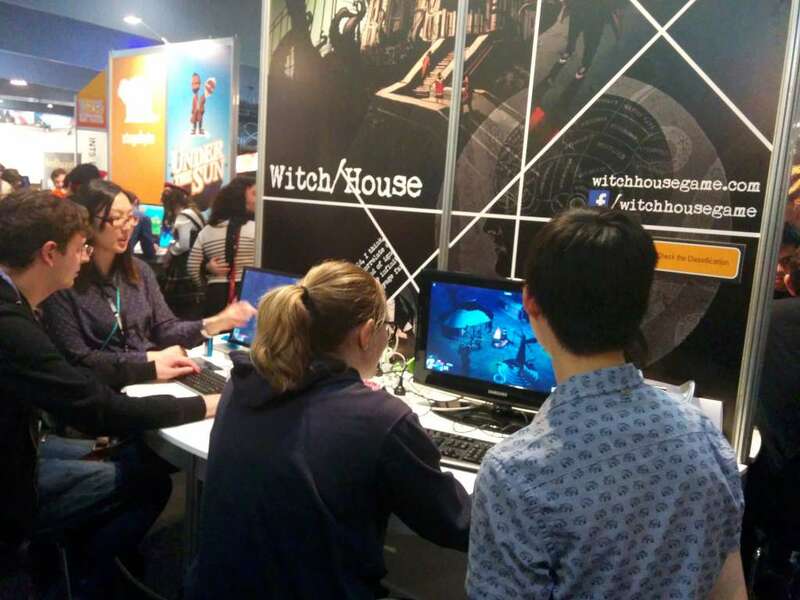 We chatted with the girls from See Through Studios about Particulars, a quark manipulation physics sim. 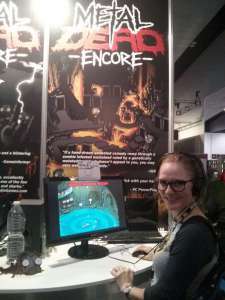 I’ll grab the demo and go over some more impressions later, but I played it for about five minutes at the booth and it was pretty good. The tutorial was fairly gentle with me but regardless, I was pretty rough at it, but I found the game mechanic nagging at me in a way which suggests I could easily spend a few hours learning to be better. Assault Android Cactus. 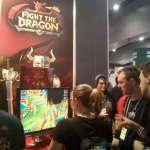 This game is getting a lot of attention, and deservedly so. 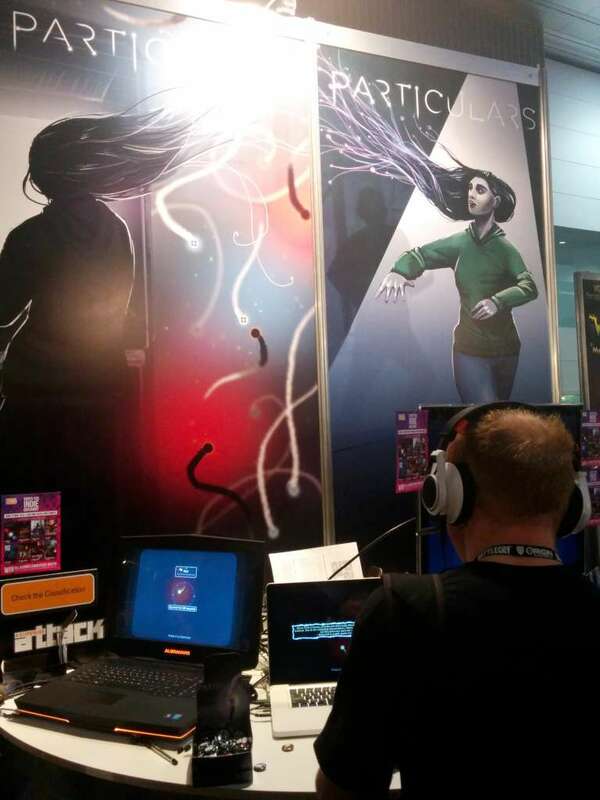 I was already sold on AAC before I saw it was at PAX; the demo has seen service as study procrastination fodder for some time and I’d been trying to organise some multiplayer but unfortunately it doesn’t support remote network play yet. This game really communicates a solid arcadey vibe, with satisfyingly chunky graphics and a simple to grasp twin stick control scheme. Its still in early access but I think I’ll pick up a copy anyway. 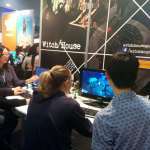 The game looks and feels fantastic; Witchbeam have created a truly satisfying arcade-y experience. Swordy: These guys were demoing a top down multiplayer hack and slash which looked cool; it was too busy on my first pass to demo but we had a quick chat to Hamish and Alexis with a brief hello to Danny before we had to go. 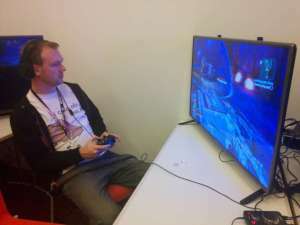 I wanted to get back there there next day but sadly didn’t, but I’ll be checking out the demo asap. Airscape: Fall of Gravity. I didn’t get to play this one either but it looked cool. I had a chat to one of the devs and was surprised to learn it is developed in HTML5. HTML has sure come a loooong way since I was making websites in notepad. Satellite Reign : A spirtual successor to Syndicate; the kickstarter for this had me throwing digital currency at the screen as fast as I could get out my paypal login when it came out so I was pretty keen to see it at PAX. 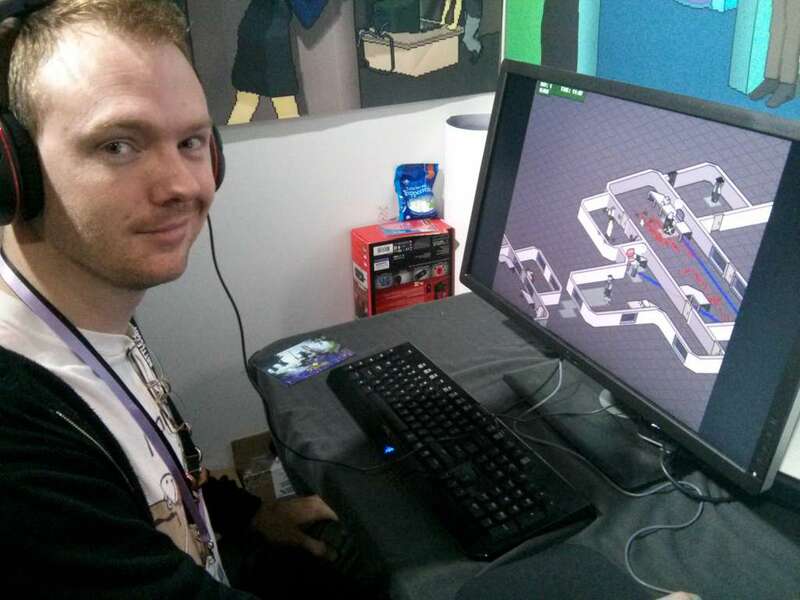 I had a chat with Dean from 5 lives studios and he ran me through part of one of the levels. I say part, because we had a scroll around and the maps are huge. There is a bit of performance tweaking to be done, but the game looks great, with the cyberpunk blade-runner future-noir look baked right in. A nice touch was the pink neon ‘Black Annex’ nightclub sign. I’m super keen for this one to be released. 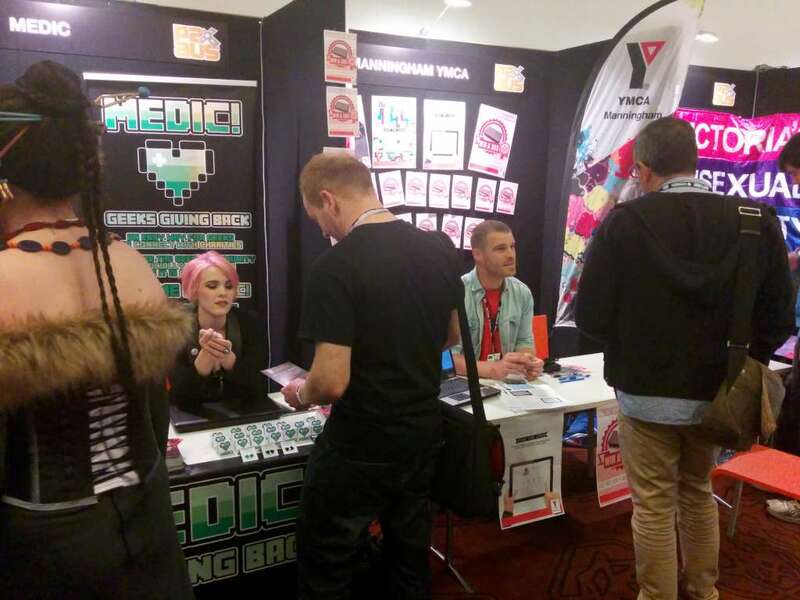 Black Annex : I’ve been following the story of Black Annex since before PAX 2013 and was keen to have a chat to Lance; I went past the stand a few times over the weekend but he looked pretty busy every time. I did sit down and play through the tutorial and although I’ve only seen video demos up until now, it seems to have received a fair bit of polish. 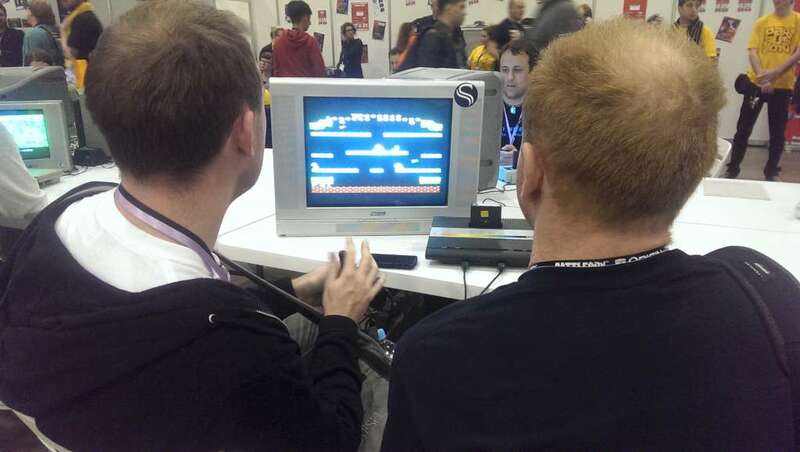 We also found time on the weekend to stop past the retro console area and settled on a few rounds of classic mario bros. My first console was actually an Atari 2600 so this was a real blast from the past. 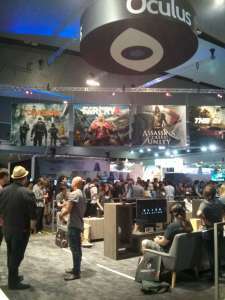 Dwight and I wandered briefly upstairs to the EA Games Community lounge which was kind of isolated and out of the way. 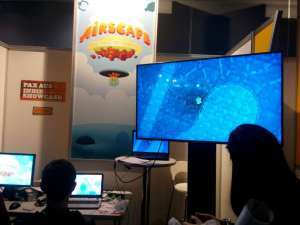 There was also a kinect dance game in the upstairs foyer which wasn’t seeing much traffic. It might have been more popular out closer to the main thoroughfare. 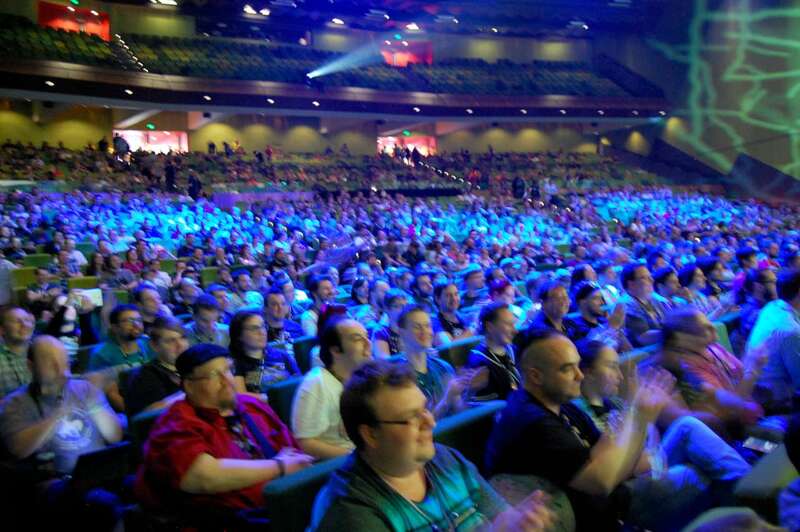 The evening schedules for PAX are no slouch. Day 1 we stuck around for the Tripod concert which was great. It turns out that Tripod are veteran gamers and really knew their stuff when it came to the references. Paul and Storm followed to an enthusiastic crowd. We weren’t able to make the MC frontalot concert on day 2 but I’ll be looking out for him next year. 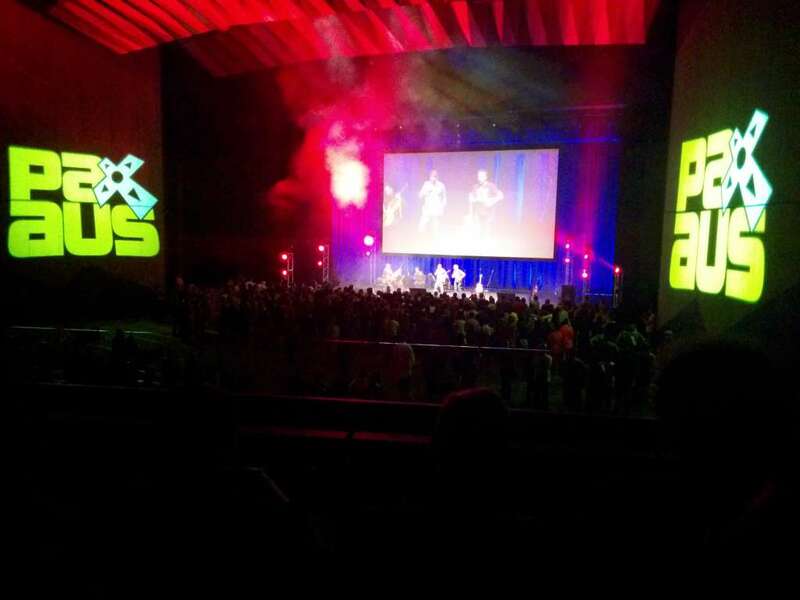 The big conclusion to PAX AUS 2014 was the Omegathon finale. 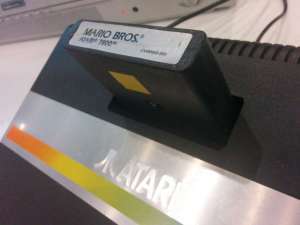 The theater was packed and the crowd cheered along while this years finalist and last years runner-up duked it out over a game of Combat Tank on the Atari – maybe even on the same console we had been playing Mario on earlier. I used to play this game as well when I was a kid. Edgemaster took the prize, snatching victory from the jaws of last years jenga battle defeat, but we’ll see Isakiko back next year. I found this years a little less edge-of-your seat than last year, but that did go to 2-all (best of 3) and this years finale was over a lot sooner. 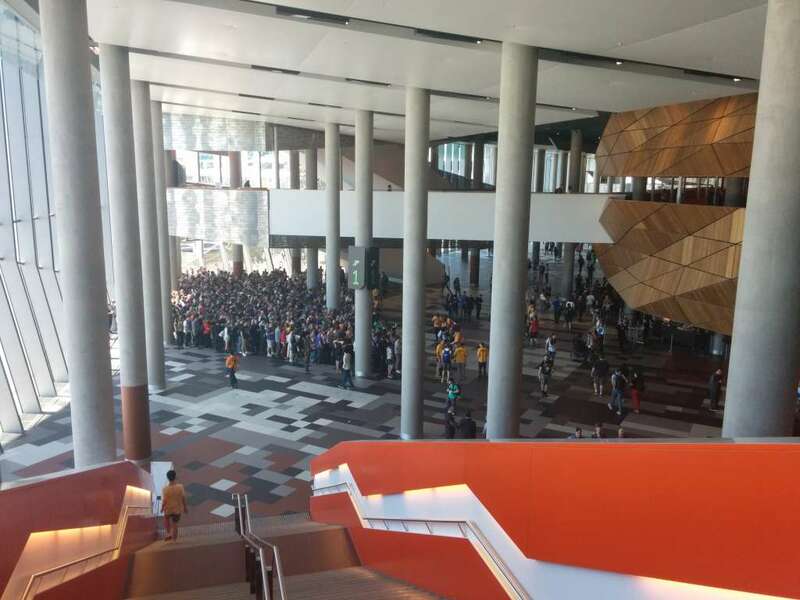 We stopped past the info desk on our way out and the Enforcers kindly gave us our QR code game trinket despite not having the last piece – we absolutely combed the venue on the last day looking for it so I think there was one missing. And that was PAX AUS 2014 – see you next year!